Pop-up windows during web browsing can be annoying. However at times, you may need pop-up windows to able to view important web content. 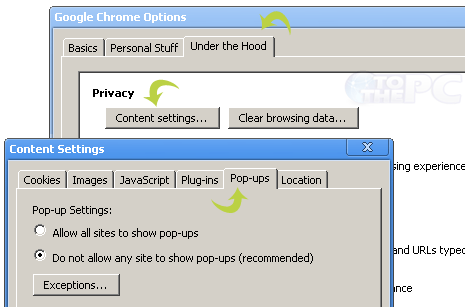 By default, pop-up windows are disabled in Google Chrome browser, you can enable pop-up windows anytime. Chrome also has option to specify exception websites that can serve pop-up windows. 2. 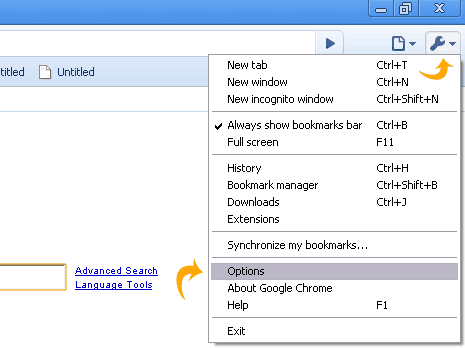 Click “Under the Hood” tab on Google Chrome options window. 3. Then click “Content Settings” button. 4. Click “Pop-ups” tab on the content settings window. Click to select “Allow all sites to show pop-ups” option to enable pop-ups. Select “Do not allow any site to show pop-ups” to disable pop-ups. You can click “Exceptions” button to allow specific websites to serve pop-ups while pop-ups from other websites is disabled.